Deploying various projects whose source is hosted on Github is now just one click away with our new “one-click deploy” feature. With this new feature, you just have to write a small JSON file placed at the root of your Github repository to make it an automatically deployable application on Scalingo. The Dasboard will also call Scalingo’s API to display the correct addons information. The user can then choose it’s project name (and .scalingo.io subdomain accordingly) and install the application. You can now make a link to our dashboard to help deploy your app on Scalingo. 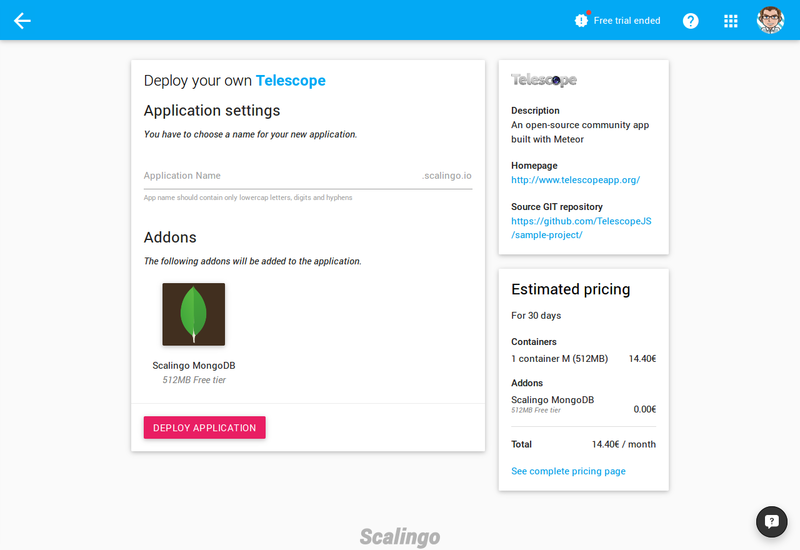 Here is such a link: https://my.scalingo.com/deploy?source=https://github.com/TelescopeJS/sample-project/. URL is : https://cdn.scalingo.com/deploy/button.svg. Thanks to Sébastien Lorentz from Good Morning Major for the design! Here is a small list of open source web applications that are already one-click deployable (just click on their logo to deploy them!). Rocket.Chat Have your own open-source Slack-like online chat, built with Meteor.